On December 4, 2015, Turkey deployed about 150 troops and 25 tanks to a base in the Nineveh province of Iraq, allegedly to train Kurdish militia fighting against Daesh. Iraq rejected the claims saying that Turkey’s military presence was not requested and authorized, and filed a complaint with the UN Security Council demanding an immediate withdrawal of the troops. The Turkish Foreign Ministry summoned the Iraqi ambassador over Baghdad’s resolution calling the Turkish troops stationed in a military camp in northern Iraq an occupying force, a spokesperson from the ministry told RIA Novosti Wednesday. However, about 100 Turkish servicemen still remain in the Ninevah province of Iraq, according to a local government official. Iraq would not allow any state to send troops to liberate Mosul from the Daesh militants, according to spokesman of Iraq's joint military alignment Brig. Gen. Yahya Rasul. 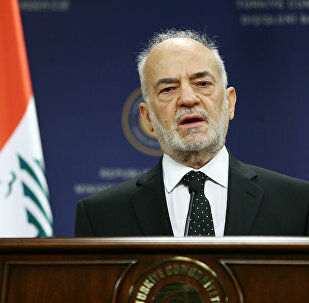 Iraq Foreign Minister Ibrahim Jaafari said that he will use all legal means to respond to Turkish troops in Iraq. Secretary-General of the Arab League Nabil Elaraby said that the presence of Turkish troops deep in the Iraqi territory is a blatant violation of the international law and Iraq's sovereignty. Turkey has repositioned some of its forces illegally deployed to the north of Iraq, Operation Inherent Resolve spokesperson Col. Steven Warren told reporters on Tuesday. Turkey will ramp up its military presence in Iraq, Prime Minister Ahmet Davutoglu said on Tuesday. Baghdad has welcomed Turkey’s decision to start removing its troops from northern Iraq, but said it would press for a complete withdrawal of Turkish forces from its territory, Iranian media wrote on Sunday. Turkey's President Recep Tayyip Erdogan is trying to take advantage of the power vacuum in northern Iraq to create a proto-state loyal to Ankara, if not annex this territory, defense analyst Stanislav Ivanov wrote for New Eastern Outlook. Turkey continues the process of its troops’ withdrawal from the Iraqi province of Nineveh, the country’s Foreign Ministry said Saturday. Turkey's invasion into northern Iraq could well be part of a plan to split Iraq into three separate states, undertaken with the approval of the US, while the recent Daesh attack on the Turkish troops plays right into the hands of Ankara, according to Russian political analyst and Middle East expert Semyon Bagdasarov. 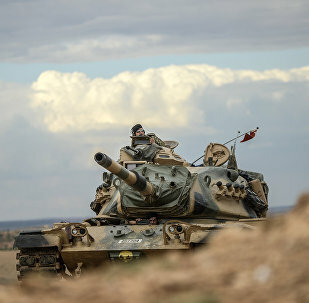 Turkish military presence is needed in Iraq for "security reasons", especially following a recent Islamic State (IS, or Daesh in Arabic) jihadist group's attack on a Turkish training camp located in the country, Turkish Prime Minister Ahmet Davutoglu said Thursday. Iraqi Foreign Ministry said that Arab League will discuss Turkish military presence in Iraq at an extraordinary meeting on December 24. Turkey's prime minister said that Ankara had taken measures "against attacks" on the Bashik camp in Iraq and said that the legitimacy of Turkish military presence there was "not under discussion". Turkey's controversial deployment of troops to northern Iraq might have looked like an "invasion" but it is in fact testimony to Ankara's strange alliance with Iraqi Kurds, which is based on a set of mutual benefits and common concerns. Some of the Turkish troops deployed in a camp in northern Iraq have left and are heading toward the border of Turkey, NTV news channel reported citing military sources on Monday. The UN Security Council has not set a date for consideration of Baghdad's complaint regarding Turkey’s deployment of troops in Iraq’s north, a source in the government told Sputnik on Sunday. 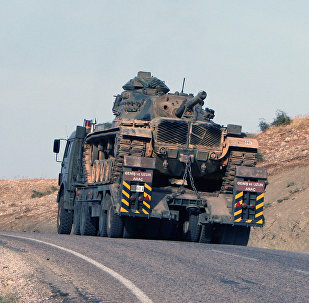 In a move to ease the tension with Baghdad over the deployment of Turkish troops to northern Iraq, Turkey has been working to bring the training camp under the status of the coalition forces, sources told Hürriyet Daily News.